“Ang swerte ni Rina!” (Rina’s so lucky!) Richie frustratingly tells my sister last week. “Since I have work, she’s going to have lunch with a few blogger friends to cover Rack’s new Pork Belly dish!” I can understand how frustrating this can be for Richie. You hear bacon / liempo / and other pork dishes, you immediately think “Richie!”. To a point that friends and acquaintances often tag him to any photo or meme about bacon in facebook. And the funny part is he’s loving it! A couple of days later, I went to Racks in The Fort Strip. Truthfully, I haven’t dined in Racks for years. I think I was highschool or even elementary the last time I ate there. 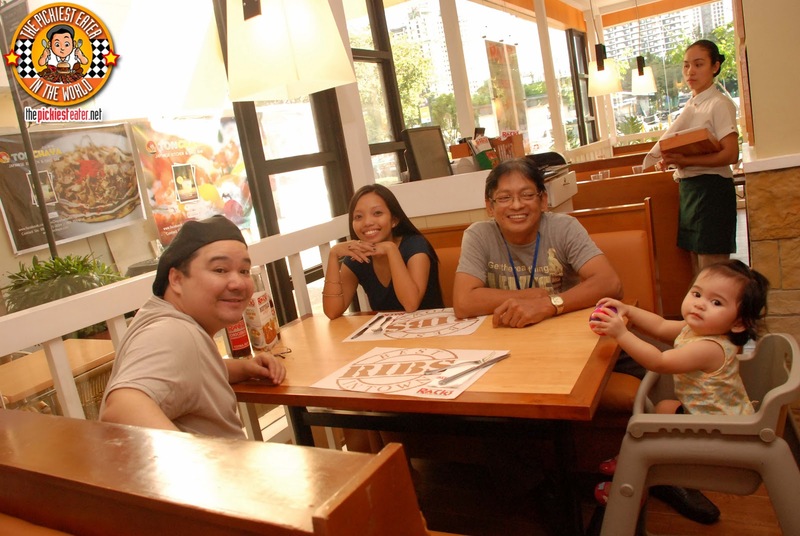 It was still the branch in Robinsons Galleria and I remember everything being white. From the floor to the ceiling. That’s why one can’t help but notice that the new Racks now has a different interior, using more browns and beige and cream colors making the place warmer. We were told as well that they had made a few changes on the menu. Looking at the new menu, I got a little bit frustrated because it’s that type of menu that everything looks so good that you don’t know what to order. If it were only possible to put everything in one platter! 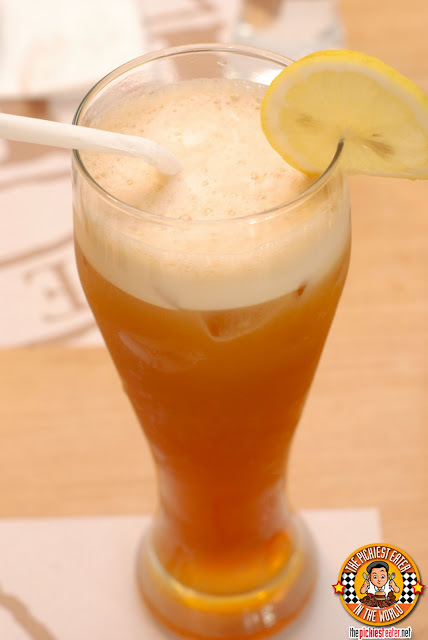 It was a hot day so I ordered a glass of tall iced tea first (P75). It was really thirst-quenching and a perfect refreshment to accompany the food we were about devour! I suggest go for the bottomless especially on a really hot day. Bottomless is only P90, and a pitcher is P145. Let's get started with the food! These are all the food we ordered for my first visit with blogger friends, and my second visit with my family. We started the feast with the Onion Brick (P195). To me it looked more like the Great Wall of Onions. The onions are cut thinly and breaded to a good crisp. For me though it’s a bit challenging to “dismantle” it out of it’s brick form since they’re stuck together. But once you’re able to, it’s chow time! It’s served with 2 types of sauces. A remoulade sauce, and their original barbecue sauce. When you eat it with the remoulade, it’s okay. Nothing really fantastic. But when you eat it with the barbecue sauce, my oh my! It’s brilliant! Till this day I still dream about this wonderful onion + barbecue sauce marriage! My sister ordered a Clam Chowder Soup (P95). She enjoyed it but her only comment was that she couldn't seem to find any clam in the soup, and instead feasted on the generous bits of potato. It still tasted good nonetheless. Even Rain seemed to love it. 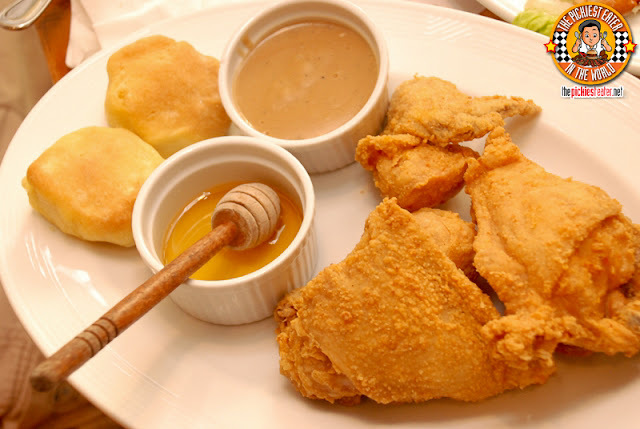 We tried the Southern Fried Chicken (P360) and my goodness I really loved it! it had that saltiness and crispiness that I was really looking for. It was crispy on the outside and super duper juicy on the inside. You have to be careful coz it squirts! 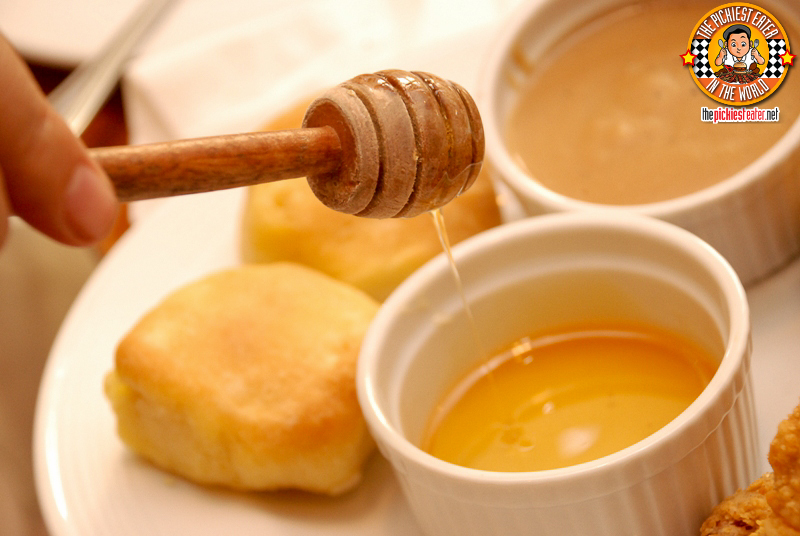 The chicken is served with yummy creamy gravy and 2 pieces of home made biscuits with honey. Richie was expecting the biscuits to be tougher. But it was unusually soft and moist, which I liked. I would seriously come back for these babies. Richie liked it, but found it to be closer to "Pan De Sal" than actual country Biscuits. 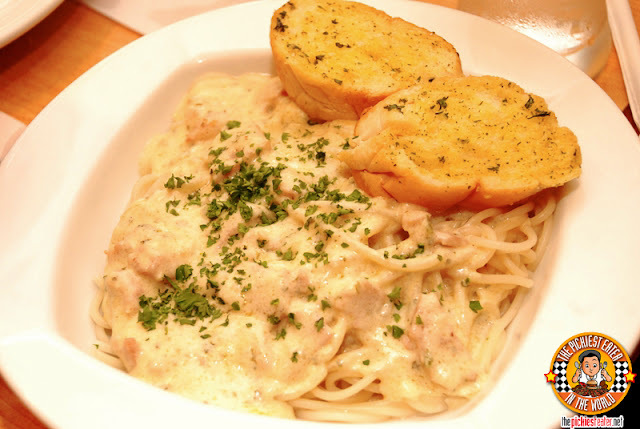 Sprinkled with parsley and Parmesan cheese, this huge plate of Carbonara (P210) is a good 'ol comfort food that never fails. This is just the single and it's actually already good for sharing. Either that or we were just too stuffed to get a bite since this was the last food to arrive. We ordered this for Rain because she loves pasta. She seemed to like it. Personally though for me I think it lacks a bit more salt. 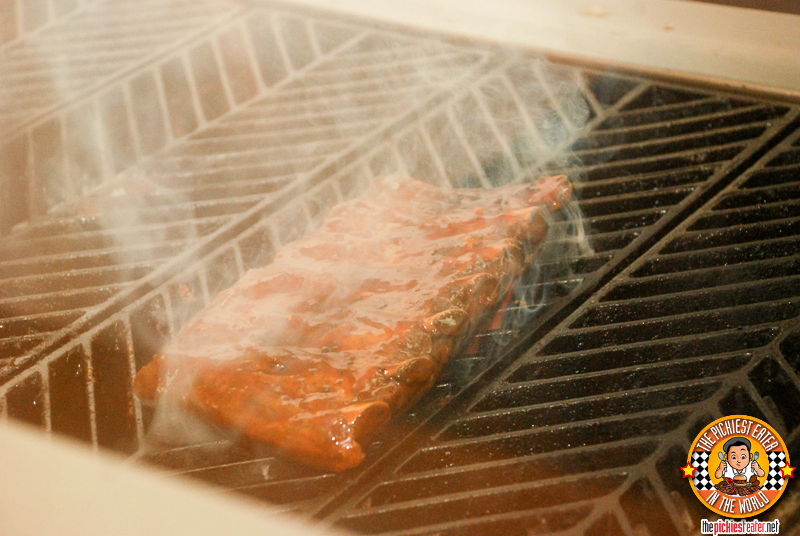 Ribs being grilled to perfection! Next was the Pork Belly Brisket (P465). I actually liked it especially with the red wine gravy, but honestly since the taste of the Kansas Ribs was stronger, it kind of over powered the taste of this pork belly. But I still enjoyed it nonetheless because it was really soft and the fat to meat ratio was just right. 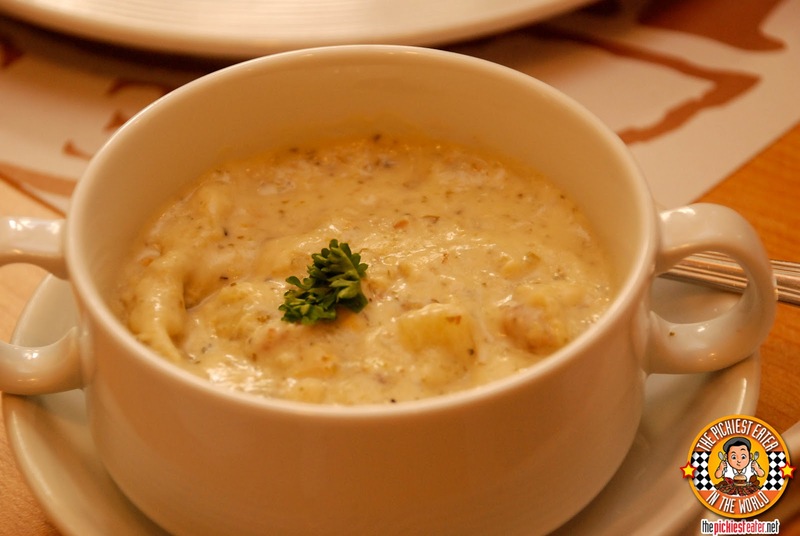 It is also served with your choice of any two regular side dishes. But we had the house mashed potato (really flavourful and super soft) and the mixed vegetables. Honestly this would be the type of dish that I would love to have paired with a bowl of steaming plain rice. (Yes I love my rice. I’m weird like that). This Memphis Pound Cake (P135) really did the trick! Just imagine a buttery pound cake, and then top that with raspberry preserves and 2 refreshing scoops of vanilla ice cream! I'd say it's good for 2 people (unless you're the type of customer who does not like sharing desert like Richie). For dessert, we had the Mississippi Mud Pie (P140). It wasn't anything mind blowing. 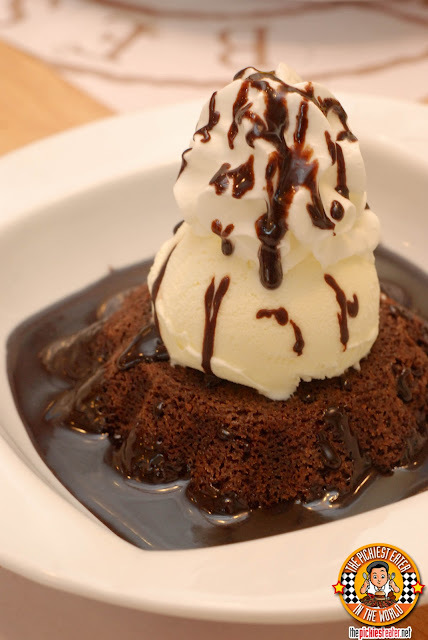 Although a cake ala mode is always a nice way to end a meal, I would have loved it more if the cake was a bit more moist. I found it to be a bit dry. 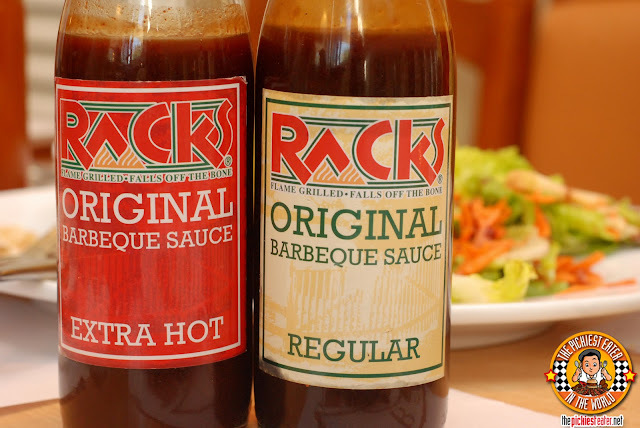 It’s comforting to know as well that even though they changed quite a few things, Rack's still retained their unforgettable BBQ sauces which are still for sale. P200 for the original and P220 for the spicy. Plus, they sell frozen packs of ribs that you can just heat and serve! Perfect for parties or a regular dinner night with Richie hehe. They’re sold at P1,120 per pack containing 2 slabs. Baby Rain is such an angeeeeeeeel. :) At parang ang bilis niyang lumaki. If I had a baby brother, I'd tell him to wait for Baby to grow up. Hehe. Haha I know!! She's growing too fast! I'm conflicted.. I want her to forever be my baby, but at the same time i'm so excited to see her grow up! 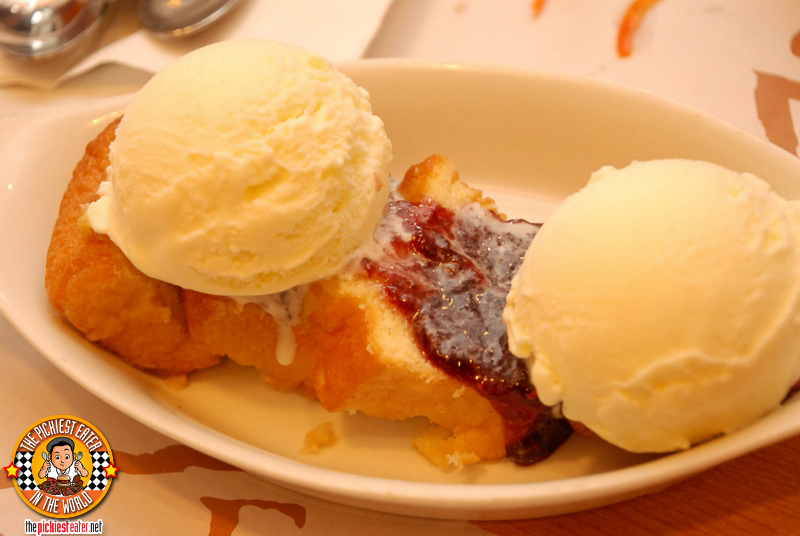 Memphis Pound Cake is one of the best desserts I've ever eaten. :) Pound cakes are usually dry, but racks' are moist. :) I'll surely join the giveaway!! Thank you so much Joy! I'm sure our readers would LOVE that! 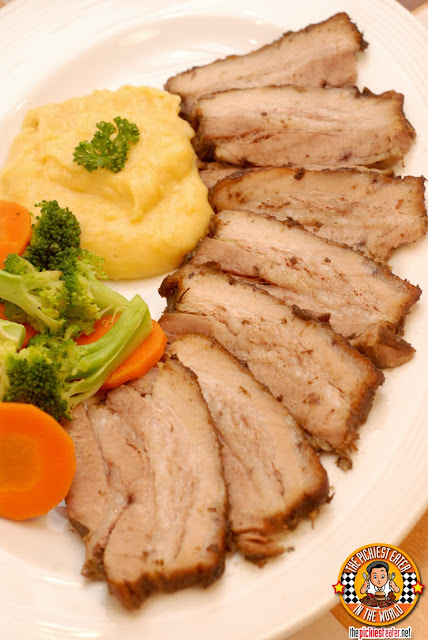 You hear bacon / liempo / and other pork dishes, you immediately think “Richie!”. --> Lol. This is so true. You can add "burgers" to the list as well. Haha thanks Kat! I take that as a compliment!! 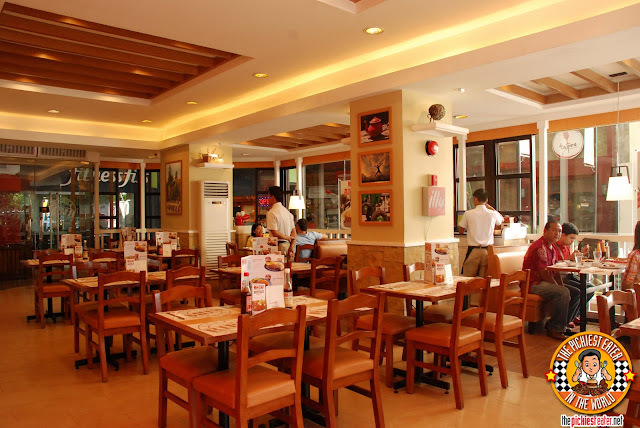 One of my fave resto. So far, the best ribs in town and over! The onion brick! The onion brick! OMG, I *love* onion rings, and finding delicious and decent onion rings at restaurants is always a challenge. You either like them or hate them, there is no go-between for me when it comes to onion rings. 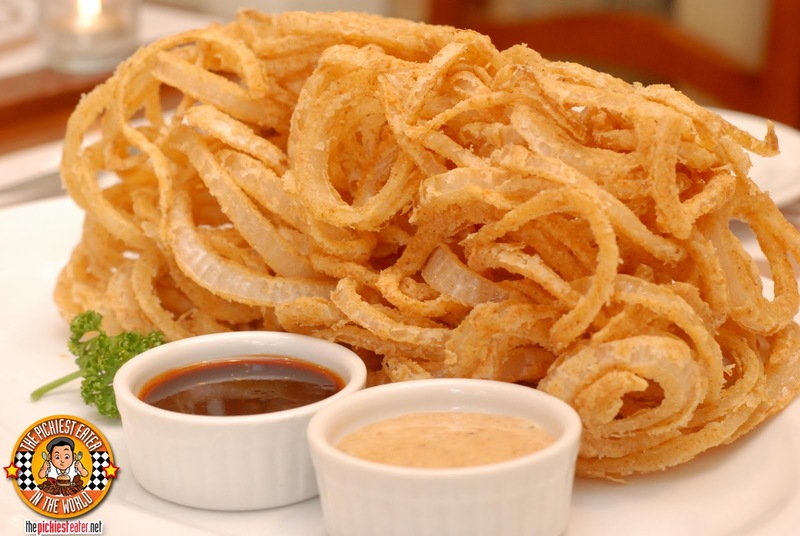 The onion brick at Racks looks exactly how decent onion rings should be--- thin, crispy breading! The ribs at Racks are really delicious. I definitely want to try their Pork Belly Brisket! 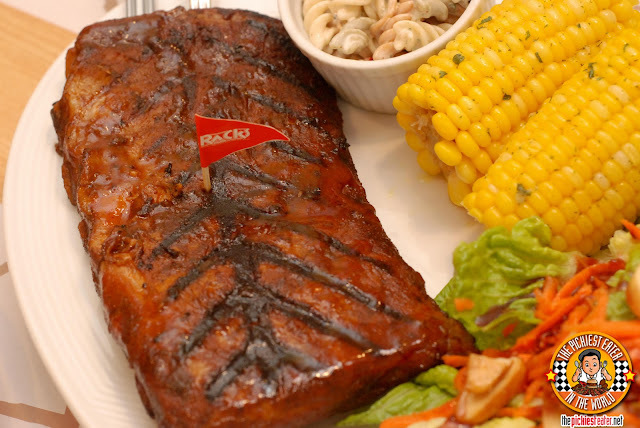 My all time fave at Racks is their Sweet n Smoky Ribs. Yummy!